The research in this report*, written by leading experts in their fields, presents an overview of climate trends across central, eastern, western, and southern Africa, and is distilled into a series of factsheets that are tailored for specific sub-regions and countries. Some of these capture the current state of knowledge, while others explore the ‘burning scientific questions’ that still need to be answered. Development professionals will be able to use the report as a touchstone in their everyday work, and as a starting point for considering climate risk. The contents of this report will also be useful for students and researchers seeking an introduction to African climate science, and to intermediaries such as climate knowledge brokers, who can tailor the volume’s peer- reviewed analysis to their broader awareness-raising, education and training efforts. *Download the full report from the right-hand column. The "Need to know" key messages for each region and the burning questions are provided below. Rising temperatures and changing rainfall patterns are and will have significant impacts across east African society. The equatorial and southern parts of eastern Africa have experienced a significant increase in temperature since the early 1980s, while seasonal average temperatures have risen in many parts of the region over the past 50 years. Rainfall in the region is extremely variable across time and space, and is influenced by several physical processes, including the El Niño Southern Oscillation. There is a lack of evidence about observed trends in extreme temperature, extreme rainfall, and drought in east Africa. 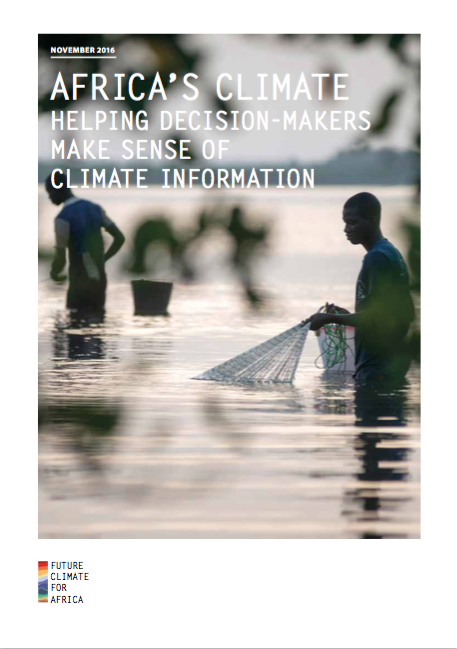 Decision-makers need accessible information on likely climate change if they are to plan appropriately for this uncertain future. The potential for wind energy. calibrating how reliable the current climate simulations are. How the results may agree with, or contradict each other, and what this means for scientists and decision-makers. In west Africa, people’s lives and livelihoods are significantly impacted by season to season, and year to year variability in climate. Climate change will worsen these impacts. Decision-makers need reliable climate projections in order to plan effectively for warmer temperatures, altered rainfall patterns, and changing frequency of droughts and heatwaves. Scientists have greater confidence in projections of future temperature change from existing climate models, than for future rainfall change. Scientists are working on both improving understanding of existing models, and on improving the next generation of climate models, to produce more reliable projections. Scientists are also working to better understand the role of human-caused greenhouse gas emissions and sea surface temperatures in driving the west African climate, especially rainfall. target regional evaluation of how these physical processes work in the models by applying an ‘Africa lens’ to the problem. Climate scientists are refining their models so that they can give decision-makers in southern Africa credible, evidence-based projections for the region’s future climate. considers the implications for those who generate, and those who use, climate information. FCFA's UMFULA (“river” in Zulu) project is a four year research project that aims to improve climate information for decision-making in central and southern Africa, with a particular focus on Tanzania and Malawi. It aims to support long-term – five to 40 year – planning decisions in central and southern Africa around resource use, infrastructure investment and cross-sectoral growth priorities, by identifying adaptation pathways that are robust and resilient in the face of climate change and other non-climate stressors. Read more about UMFULA here. FCFA's FRACTAL project will contribute to improved understanding of climate processes that drive the African climate system’s natural variability and response to global change. By bringing together scientists and people who use climate information for decision- making, the project will enhance understanding of the role of such information. FRACTAL will distil relevant climate information that is informed by and tailored to urban decision-making and risk management. The team’s activities will understanding of how scientists from different disciplines can work effectively together. Read more about FRACTAL here. FCFA's HyCRISTAL project will develop new understanding of climate change and its impacts in east Africa, working with the region’s decision-makers to manage water for a more climate-resilient future. Read more about HyCRISTAL here. FCFA's AMMA-2050 project will improve understanding of how the west African monsoon will be affected by climate change in the coming decades – and help west African societies prepare and adapt. The AMMA-2050 team will investigate how physical processes interact to cause ‘high impact weather events’ such as storms and heawaves that affect lives and livelihoods. Not only will they look at how the total amount of rainfall is likely to change – but also at how rainfall is likely to be distributed throughout the wet season. For example, heavy rainfall concentrated in just a few hours places great stress on human settlements, infrastructure and agriculture. By applying expert judgement, they will identify adaptation options in water resources and agriculture. Read more about AMMA-2050 here. FCFA's IMPALA project will focus on a single climate model, the Met Office Unified Model, to improve its simulation of African climate through a better understanding and representation of weather and climate processes. This will result in reduced uncertainty in future projections of the African climate and provide valuable information to climate scientists and modellers within Africa and worldwide, and empower decision-makers with information that can be used to reduce risks and help protect the livelihoods of the most vulnerable. The initiative aims to deliver a step change in global climate model capability that will reduce uncertainty and enable better informed evaluation of the robustness of future projections. Read more about IMPALA here. Read about "Mainstreaming climate information into sector development plans: the case of Rwanda’s tea and coffee sectors"
Read "How to understand and interpret global climate model results"
Read "The utility of weather and climate information for adaptation decision-making"
Read "The Climate Knowledge Brokers Manifesto: Informed Decision Making for a Climate Resilient Future"